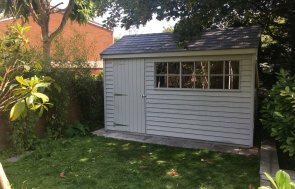 This light-filled Superior Shed has been installed in a secluded corner of our customer’s garden in Windlesham, Surrey, not far from our Sunningdale Show Centre, to use as a carpentry workshop. Having Velux® windows in the roof of a Superior Shed isn’t something that is usually requested by our customers, because you need a stronger material than our standard heavy duty felt to be able to support the weight of these windows. With that in mind, the customer chose to have our highly durable grey slate effect tiles on the roof, so that his two Velux® windows are perfectly supported, and they will allow that extra bit of natural light inside, which is exactly what the customer wants. Black guttering has been installed to protect the windows on the right-hand side from too much rainfall, and the doors and window in the front gable are offered some protection from the roof overhang. The paint used is a neutral colour, Ash, from our Valtti paint range, to help the shed to blend well into the garden. 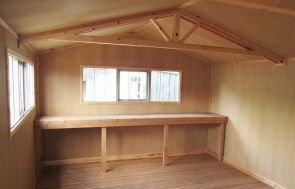 To help the customer get what he wants out of his garden workshop, he has also opted to have a security pack, and inside, there is oak faced ply lining on the inside, as well as insulation in the walls and ceiling, and a workbench along the wall under the windows. 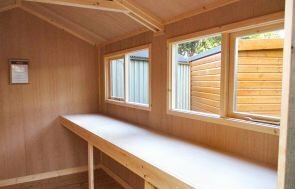 To create your own ideal Garden Shed, please use our Online Garden Building Planner Tool to get an idea of the different sizes, styles and features you can choose. If there is anything that our online tool can’t do for you, such as a specific size or feature that you would like, please call us on 01760 444229 or send us an online enquiry to discuss your requirements with us.